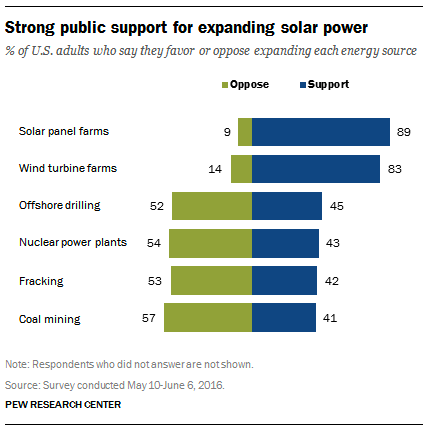 Though the metaphor is whimsical, the data behind it further drives home the point: according to research from the Pew Research Center, 89% of American adults wish to expand solar power— more than any other electricity source included in the poll. Many see its benefits for both the environment, as well as the economic perks for participants. But the advantages don't stop there. The solar industry was responsible for 1.2% of all American jobs created in 2015, or one out of 83 jobs. American companies First Solar and SunPower are among the biggest producers, and along with SolarCity’s upcoming Buffalo, NY "gigafactory", could spell a revival for specialized American manufacturing. Along with manufacturing, the accompanying components of the solar industry are also expected to grow. US solar job creation is approximately 12 times higher than the nation's average, resulting in a workforce set to exceed the population of some entrenched fossil fuel professions, such as the oil/gas pipeline construction and coal industries. At the time of writing, the 30% federal investment tax credit (ITC) dedicated to increasing interest and affordability of solar projects will continue through 2021. While political incentives may be jeopardized, current market forces suggest the progress of renewable energy will continue onward.